Ocean Towers is located in Boca Raton, Florida, just south of the Boca inlet and the World Famous Boca Raton Resort and Club. 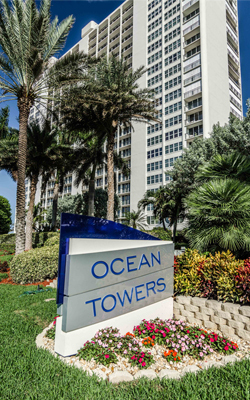 Only Ocean Towers offers the opportunity to live directly on the Ocean in one of two Luxury Towers in Boca Raton. Each of the magnificent residence overlooks endless miles of sea and sand from a rare Direct Unobstructed Vantage Point. Condominium Apartments range in size from 1,423 to 2,173 Square Feet (132 to 202 Square Meters) with several Ultra Luxury OCEANFRONT Condominium Estates of 3,596 Square Feet (334 Square Meters) of air‐conditioned space plus huge OCEANFRONT Balconies.